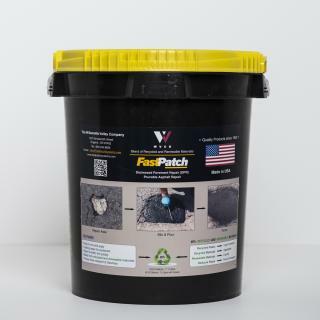 April Special Offer: Purchase 10 or more FASTPATCH DPR Pourable Asphalt Repair 5-Gal Kit and receive 1 Eggbeater Style Mixer FREE! - Limited time offer ends Tuesday April 30, 2019 11:59pm. FASTPATCH DPR Pourable Asphalt Repair is an easy-to-apply, long-lasting repair material for distressed pavement. FastPatch DPR Pourable Asphalt Repair is supplied in complete, ready-to-use kits with a polymer blend of recycled and renewable materials. Each kit comes with Black topping sand to blend the repaired areas with the surrounding pavement. FastPatch DPR Pourable Asphalt Repair can be applied in cool or warm conditions, and in cold conditions with the aid of FASTPATCH Kicker accelerator (free upon request), to form a permanent repair that is quickly ready for traffic. I had about a 1 1/2 gap between the asphalt cul-de-sac and our concrete apron on our drive way - and the existing asphalt at the edge between both had "worn away". 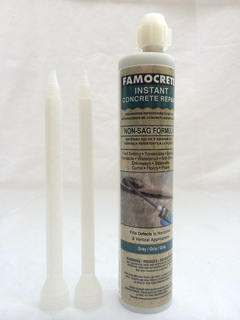 This product fixed that problem in less than 2 hours of prep and application! It filled the gap completely and was "extremely easy" to apply. Ensure that you use the "egg beater" style mixer on your cordless drill - it works great. I would highly recommend this product!